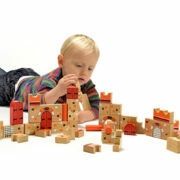 Children will adore this wonderful handcrafted Lanka Kade Castle Building Block Play Set! This fair trade wooden play set includes everything your little one needs to build their very own castle. Made from responsibly sourced rubber wood, each piece has been hand painted in beautiful detail. This 46 piece set includes various shaped building blocks painted with a brick pattern including; doors, battlements, steps, a portcullis, plus two brave knights. Supplied complete with a handy bag to neatly store away after play. 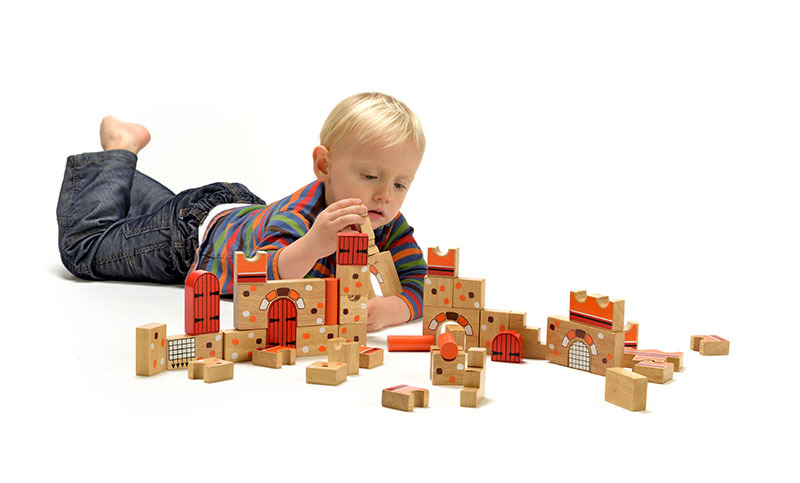 Children will adore this wonderful handcrafted Lanka Kade Castle Building Block Play Set! This fair trade wooden play set includes everything your little one needs to build their very own castle. Made from responsibly sourced rubber wood, each piece has been hand painted in beautiful detail. This 46 piece set includes various shaped building blocks painted with a brick pattern including; doors, battlements, steps, a portcullis, plus two brave knights. Supplied complete with a handy bag to neatly store away after play. Children will have great fun learning how to construct their own castle and enacting their own battles. Building blocks are a great way to encourage imaginative play and inspire creativity. They also help develop dexterity, problem solving skills, hand eye coordination and shape recognition.